Some say the longboard is the ultimate ride. It's the perfect choice for beginners, advanced surfers and salty old dogs who like to yell. The smooth glide and excellent float lets you get creative: pop and squat, do a head stand, hang 10, enjoy a party wave....no matter what your skill level or your flavor of fun, you'll find it on a Soulr Longboard. That's because our hand-shaped designs perform in a huge range of conditions, giving you the edge to catch what you paddle for. 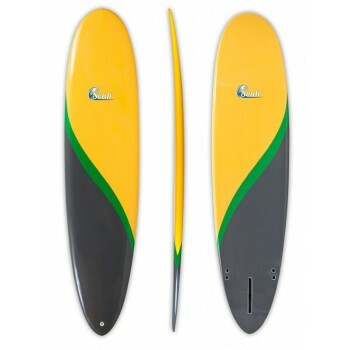 If you're a newbie looking for a board to start out on, we recommend our squash tail longboard. Its a tried-and-true shape that offers plenty of float and forgiveness, while giving you a great platform to progress on. For more advanced surfers wanting an ultra smooth ride and super light construction, take a good look at our rounded-pintail longboard. It's fast, snappy and performance oriented. Whether your working with mushy slop or a firing swell, you'll be able to make the most of the conditions with a Soulr under you feet!